'Voluntourism' is a big buzzword for travellers these days. By definition, volunteer tourism is international travel which involves volunteer work. The idea is driven by travellers who wish to 'give something back' to the places they visit. Usually, the volunteer work is facilitated by a charitable organization and can range from a few hours of general labour to months of specialized, professional work. Sound like your kind of thing? Volunteer Programs International, Voluntourism.Org and Go Overseas are good places to start a search for a program that's a fit for you, depending on where you want to go, how long you can stay and what type of work you want to do. There are established agencies offering programs all around the world. Some agencies require placement fees on top of your own travel and living costs, while others don't. Do your research and be choosy to find a legitimate, community-based program. When I was visiting Bhutan as a tourist in 2009, I was simultaneously thinking, "I really want to come back to spend some time here" and "someone needs to make a quality cultural map for Thimphu City". It wasn't until I was in my seat flying back to Bangkok, my mind still wandering along those misty Bhutanese mountain roads, that these two thoughts melded into one idea. I realized I could use my own heritage interpretation know-how to get a map made for Thimphu. I arrived home and started researching voluntourism and work for foreigners in Bhutan. I discovered the Bhutan Canada Foundation's Teach In Bhutan program, the NGOs supported by Japan, Switzerland and a few other countries, plus various medical campaigns for bringing doctors in on treatment tours. None of these programs were involved in my area of expertise, heritage management. Also, none of the existing voluntourism agencies operate in Bhutan, which is not surprising given that it is one of the strictest countries for entry as a foreign non-tourist. So, it was clear that I was going to have to figure out my own way to make this happen. These are the steps I followed to create my own voluntourism placement where there was no existing program in place. This is my experience only but I believe the story may be relevant to others who are dedicated to creating their own volunteering opportunity abroad. This process is about undertaking a significant planned project, a big investment of your time and your specialized abilities to accomplish a goal. Analyze what you have to offer. What are your assets, your skills, what can you do that can make a difference? Is there one specific thing that you can contribute to a particular community? It was easy in my case: I identified a gap. A detailed map for Thimphu would not only really add to tourists' experiences by helping them to navigate and understand the city better, but a greater awareness about the businesses and services available would mean that more merchants would benefit from the presence of tourists in the city. I had worked on such map projects before and had done lots of research into urban interpretation and city maps, so I had a rather specialized skill set to offer. What do you hope to get out of your volunteer work? Do you have something real to contribute? Or do you mostly want an extended vacation? I think it's totally acceptable if you want to spend time in a different culture, meet new people and have some special experiences as long as you've got a lot to offer in return. Your enjoyment should not be the top priority here! I admit that one of my motives was to actually get the chance to use my knowledge of and passion for urban interpretation for a real project. I have found that in Canada, even if you are highly skilled, you often aren't permitted to contribute to established volunteer projects if you don't have the right social connections or if you haven't been a board member for 15 years or whatever. It is frustrating. In Bhutan, the whole country feels like a heritage site, but heritage site interpretative projects are not common for various reasons. There are very few people there with experience in this somewhat obscure field of study. I felt that my knowledge of interpretive maps would go a lot further in Bhutan. In addition, I wanted the chance to spend an extended period of time there. • Research and develop your idea. Network, ask people in the know for advice. Adjust your idea if necessary. Is your skill of use or in demand where you want to go? Is your work needed at all? Are you going to be a valuable resource for an organization, or are you going to take up valuable resources? Would your contribution as a volunteer deprive a local person of a paying job? This a particular concern for non-skilled volunteer work. During my research, I discovered that there actually was an earlier Thimphu tourist map that had been published, but it was no longer available. Also, that map's concept was totally different from my map concept. I knew I would not be taking anyone's job for the reasons mentioned above but I made sure local talent would be hired for the help I would need to finish the project. Talk to some real people about your idea. Maybe you already have a direct connection with a community overseas through your friends or family or a professional affiliation. If not, via social networking, you should be able to get in touch with people in the place or the field you're interested in. You'll want to get opinions about how you would be able to contribute as a volunteer and who might be able to use you. In my case, it was a comment I left on the blog of a Thimphu resident that set everything into motion. (Hi, Aby!) I also bounced ideas off other in-the-know people I connected with via Twitter, Facebook and blogs. My connections gave me feedback about the appropriateness and feasibility of my map concept. Their advice was encouraging. • Think about potential partners for your project. Unless you have the funds, know-how and time to establish your very own NGO, you're going to need to partner up with an organization. Someone will have to sponsor your visa, help you get established and arrange what you need to do your work. It's research time again! Put together a list of possible partners such as local charities, non-profits/NGOs, educational institutions, community groups, foundations, local enterprises, town council departments and so on. Thinking 'outside the box' is recommended! I had a list of organizations in Bhutan to approach with my offer to work but in the end, I connected with a group that wasn't even on my radar. I ended up working for a local company, not a charity or an NGO. So, I suppose, technically I wasn't volunteering but working pro bono. Either way, my project found support. • Put together a detailed proposal. Put together your CV, a thorough explanation of your volunteering idea, examples of similar projects elsewhere if they exist and a full list of all the resources you will need to make the work happen. My proposal included a lengthy write-up on my Thimphu map project objective, a time-line for my work to be completed, examples of other similar map projects and my resume. I listed that I would require support from the organization in the form of a work visa, work space with Internet access, help making connections with local experts plus assistance with accommodation in Thimphu. This was also where I specified that a Bhutanese artist would need to be hired to illustrate the map. Now, use your connections and potential partner list to make the offer of your talent and ideas. The group(s) you approach will probably need some time to consider your proposal. You may need to negotiate or consider adjustments to your project. Got a 'no'? Try another organization, continue to refine your idea. I was extremely fortunate in that I was taken on by the first organization to hear about my map idea and no changes to my proposal were required. Turns out, this was the easiest part of the process for me, although I'd expected it to be the hardest! Is your project going ahead? Congratulations! Most likely, you'll now need to make arrangements to leave the country. Deal with your job/family/house/pets/finances/health/etc. I quit my job, moved out of my apartment, bought plane tickets and apologized for missing a wedding. • Do the paperwork correctly, double-check everything. Find out if volunteers need a work visa to go wherever it is you're going. Don't be sneaky by entering the country on a tourist visa if you're primarily there to work. You can get yourself into hot water if you're caught, but even more worrying is that you risk causing a lot of trouble for your sponsoring organization. Be legal about volunteering. Also, double-check all your visa paperwork, especially if you're partnered with an organization that doesn't have experience bringing in foreign talent. As I mentioned, Bhutan is a tough place to get into. I was waiting for a work visa before I went ahead with the life organizing steps mentioned above. My visa paperwork went through four government departments and it took almost six months to be approved, having been rejected once before being accepted upon the second reapplication. By establishing what I wanted to do and putting my energy into making my dream a reality, I was in danger of a big disappointment. Seriously, the long uncertainly ate away at my very soul. And here's what happened to me when I failed to do the double-checking step. • Arrive. Do the work! It might take a little time to get your bearings once you arrive but you've got to settle down and do the work you promised to do! • This isn't simply a vacation! Okay, some tourism time is fine, though. Fact: I saw more parts of Bhutan during my initial 11 day tour than I did during my four months there. I spent many long days working but I found time for some exploration, too. • Leave with the work as well wrapped-up as possible. Actually finishing the project is ideal but you may run out your work visa before you do. If a visa extension isn't an option, tie up as many of the loose ends as possible so someone else can carry on your work. Depending on the nature of your project, perhaps you'll return to continue another time? • Come 'home' and get on with life, or go in a new direction? I'm 'home' now, and after a few months of unemployment, I'm about to start a new job. But... I would definitely love to take off and make more cultural tourism maps elsewhere, or to do more heritage management work in Bhutan in the future. • Keep in touch, do follow-up work from home. You're engaged with the organization now, take responsibility for what you started! Maybe that will be a written summary of the work so far to assist a future volunteer. Perhaps you'll help out back home with promotion or fundraising for your agency (if it's a non-profit). Can you work on a proposal for the next phase of a larger project? Maybe your idea was just the beginning of something BIG! So, that's how it happened for me. Or, rather, that's how I made my voluntourism dream into reality with a lot of thought, painful waiting, plenty of effort and a huge amount of help. 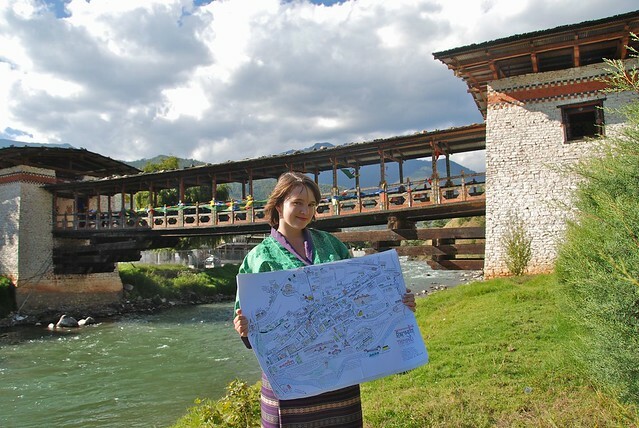 Author Lisa Napoli wrote a short summary of my Bhutan map project, describing me in rather more flattering terms than I would use for myself. (Note: it's not that I "didn't take no for an answer": the first organization I approached about the project was keen. It was the work permit from the government that held things up.) I don't wish to sound self-congratulatory about all this. The result of my project map is not in anyone's hands yet so I don't have feedback from any users or from local stakeholders. Right now, it's too early to call the Thimphu map a success or a failure. I will update as soon as I get a look at the actual printed map. So exciting! Update: the map has been published! I can't believe you did that all on your own! I thought you had been offered the position somehow. This just blows my mind! I also hadn't seen your completed map. It looks so nice! @Lara Yep, I did all that myself. (And you read all that? Also impressive!). The map in the picture was actually my colour draft. The final version has been illustrated in a most delightful way by a Bhutanese artist. It looks so good! Fantastic post! It really shows how much can be accomplished when you take initiative. A great example of a positive voluntourism experience. Thanks for sharing! That was an excellent post! I had heard of some of your efforts but to read all that you went through to realize an idea is inspiring! I know both you and your sister arranged to do volunteer medical work in East Africa using your own connections and abilities. Would love to know more about how that worked, what you did to set it up. Great information here and it is really impressive you figured this all out on your own. I have considered volunteering so I will keep these tips in mind.